Building on Progress. Accelerating Toward Prosperity. It’s time to transform what could be into what will be. That means amplifying the economic success of the past with a robust, future-based strategy that targets high-quality, innovative and more diverse opportunities. Introducing Prosper Omaha 2.0, the Chamber’s next, transformative 5-year economic development campaign. 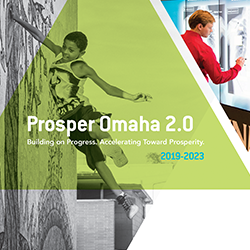 Designed to build on progress and accelerate toward prosperity for all residents, Prosper Omaha 2.0 frames a series of priorities and strategies, key performance indicators, five-year outcomes and macromeasures with a focus on business growth, people and place. Welcome to a new trajectory of growth based on building the capacity, innovation and competitiveness of our core industries, attracting and building new knowledgebased businesses, and nurturing a dynamic ecosystem of innovation and startups. Greater Omaha is changing. We are aging and our next-generation is more diverse and more educated. Our talent strategy focuses on embracing our diverse population as a community treasure, showcasing premier inclusive-hiring and promotion practices, and bolstering our efforts to develop, retain and attract the nation’s top talent – ensuring that every resident has the opportunity for prosperity. Great cities have a vibe that says, “there is something going on here.” That’s why Greater Omaha is fast becoming one of the most inspirational places in the world – a place where your senses (what you see, hear, taste and touch) confirm this region’s high energy, no-holds-barred flavor. An ambitious and prosperous future is within our reach, but success is going to require “all-in” engagement – everyone doing their part to help achieve our greatest potential as a region. New jobs, payroll, investment and tech startups. The nation’s top talent living, working and thriving right here. A stronger urban core, modern transit, increased community marketing – and an elevated global standing. Please complete the brief form so we may further discuss your interest. Together, we will accomplish more. Launched by the Greater Omaha Chamber, United Way of the Midlands and Urban League of Nebraska – hundreds of people across the region worked to identify the area’s most critical trends and plausible futures. People, Place, Prosperity became our theme. It’s based on what’s coming, who’s coming and how we can establish ourselves as a world-class region. The Prosper Omaha 2.0 plan was developed to help reach the Greater Omaha 2040 vision. Claas North America Holding, Inc.
Behlen Technology & Manufacturing LLC. Black Dirt Land & Sales Management LLC. Since 2014, our Prosper Omaha strategy, fueled by $25.9M of support from 300 investors, has produced almost 300 landed projects totaling $4.2B in capital investment and more than 13,000 jobs for Greater Omaha. 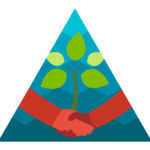 We wish to extend our sincere gratitude to the organizations and individuals whose generous financial commitments support Prosper Omaha. 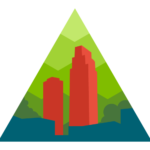 Prosper Omaha 2.0 is the latest funding program for the Greater Omaha Chamber Economic Development Partnership. The program has a tradition of focused, economic development activity that companies, foundations and individuals have been investing in for over 20 years. Greater Omaha Chamber Economic Development Partnership represents a six-county area that includes the Greater Omaha Chamber (Douglas County), Cass County Nebraska Economic Development Council, Gateway Development Corporation (Washington County), Sarpy County Economic Development Corporation, Greater Fremont Development Council (Dodge County) and Advance Southwest Iowa Corporation (Pottawattamie County). 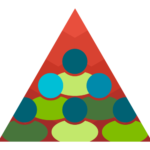 This seamless regionalized partnership operates as a one-stop shop, driving growth and championing collaboration.